"We currently have 34 GPS satellites on-orbit with a combined 380 years of service." 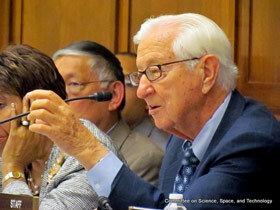 Chairman Ralph Hall presiding over the House Science Committee hearing on September 8, 2011. May 7: GPS: Can We Avoid a Gap in Service?